The sixth Sanfermin running of the bulls had a new bull breed – the Victoriano del Río (from Guadalix de la Sierra, Madrid) – make their debut in Pamplona. There was a noticeable drop in the number of runners compared to the weekend and it was an extremely fast and clean run (2:17sec.). One of these large black bulls raced in front of the rest of the pack half-way up Santo Domingo. And it kept up a frenetic pace all the way to the bullring. The runners had a lot of difficulty in trying to follow the pace of the bulls, but some fine running could be appreciated, especially in the Estafeta stretch. There were lots of falls and trip-ups and some runners were run over by the bulls, although it would seem that there were no injuries from gorings. 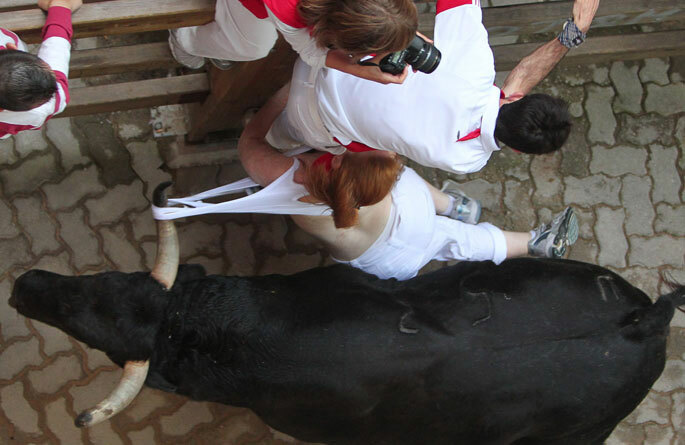 Three runners were taken away to the Pamplona hospitals for treatment for bruising. Gone again the running began at a frenetic pace in the Santo Domingo stretch where a black bull overtook the rest of the pack and it ran the whole length of the course charging ahead on its own. Such was the pace of the bull that it was very difficult for the runners to stay in front of its horns. The leading black bull charged into the City Hall stretch and across Mercaderes. One of the rear bulls slipped up at the beginning of Mercaderes, but it quickly got back on its feet and continued to run alongside the other bulls. In Estafeta pack quickly broke up into two groups with the front bull still leading since Santo Domingo and another two bulls several meters behind it while the other three rear bulls continued to race behind the bell-oxen. At the start of this stretch, on the right side, there was a small pile-up but the pack of bulls ignored it completely. The gap between the groups allowed the runners to get in close in front of the horns but the bulls were travelling so fast that it was difficult to stay for any length of time close in front of the horns. Here, there were lots of falls as this was the most crowded stretch of the course. Some bulls stepped on fallen runners but there were no injuries from gorings. At the fencing leading to the stretch that goes down into the bullring, there were some moments of danger when a couple of bulls caressed several runners with their horns and made a hole to a woman but, luckily, they did not attempt to charge the runners and they continued straight ahead at a hectic pace. The leading black bull continued its hectic pace and arrived in the arena of the bullring alone with two other bulls coming up several meters behind. The first bull entered the ring without heading for the pens but luckily the two bulls coming behind picked it up and all three went off towards the pens without more ado. The three rear bulls continued to follow behind the bell-oxen and when they entered the bullring, they headed directly for the pens to finish a very fast run of just 2:17sec. 10º encierro más rápido. El 1º es el del 08/07/1998 (2'12''). Encierro más rápido desde el 11/07/2006. 16ª vez que no hay corneados en un encierro celebrado en 12 de julio.